You’re the type of woman who gives your all to everyone: you show up crushing it at your job, you’re kind to everyone who crosses your path, you’d never hurt a fly. People are drawn to your big heart! But, behind that big heart, you’re struggling to balance it all and do it all on your own. and your energy just isn’t poppin’ the way it used to. You want to feel confident in social situations again, without layers of makeup, fake convos or small talk. You don’t want to sacrifice brunches and happy hours, but you ALSO don’t want to sacrifice your happiness and health goals. If you could find true balance, truuuuue balance, maybe you’d see different results or feel better about yourself. Maybe you’d stop spending $50 a month on sweets and treats that you don’t really need. Maybe you’d save time researching the latest health trends online. Maybe you’d stop scrolling through your Instagram comparing yourself to the fitness moguls. You’re motivated, you’re really trying! It’s not for lack of effort but there’s just something missing. It doesn’t have to be this way forever. These things are all too common for women but that doesn’t mean they’re normal. Most women feel like they’re swimming upstream, hustling to get healthy. There’s a NEW way to work with your female hormone cycle instead of against it. Are you ready to feel comfortable and embrace this part of being a woman? Let’s find your balance without giving up your goals (or the dark chocolate!). Gain a working knowledge of food and physical activity that affects your unique body. You should know which foods work WITH your female body for optimal hormone health. Doing so will naturally crowd out the “fake foods” that does your body more harm than good. You must also discover exercise that helps you feel comfortable, strong and energized in your own skin. No crazy restricting, prescribed diets, or unhappy taste buds here!! Women ultimately want to feel confident, cared for and loved. GLOWING from the inside out! Create consistency and routines around healthy habits by being held accountable by a vibrant community of women. You’ll be given all the tools, tips, and tricks you need to be successful. This program is designed to teach you healthier habits and to provide you a holistic perspective on women’s wellness. This is not your average program. Yes, food and exercise play an important role in health and wellness but in order to reach your true wellness goals, we gotta dig deep! AND CRUSH WORKOUTS DAILY, HONEY. BUT TO BE TRULY WELL, WOMEN HAVE TO BE WELL FROM THE INSIDE OUT. You’ll learn something new: about your health AND about yourself. Each week, the program will focus on a different aspect of wellbeing. Set intentions, get to know your group and create your vision for transformation. There’s a lot of conflicting information around what to eat for optimal health. You’ll learn how processed foods, synthetic hormones, and sugar keep women from their health goals. You’ll learn how to add greens, fruits, protein and healthy fats. Watch as your skin starts to glow, your energy levels increase and your body detoxes naturally! The body needs both energizing movement and softer movement to get the balance it needs. For women, that can look like pairing a couple days of yoga and pilates with a couple days of more intense cardio. Find your flow this week. Most women hang out in the sympathetic nervous system, which is where our “fight and flight” lives. Our bodies don’t know the difference between you running from a jungle animal or you being overwhelmed by your to-do list. So, get into your parasympathetic nervous system, which is where “rest and digest” systems live. How do you keep up the momentum to make healthy dieting and lifestyle sustainable? Whatever it looks like for you, you’ll find it this week. Ready to treat the root cause, not the symptom, and take back control together? I could chat with you here all day, but don't take it from me! an integrative nutrition health coach with a specialty in women’s health - and I’m here to welcome you to the judge-free zone. 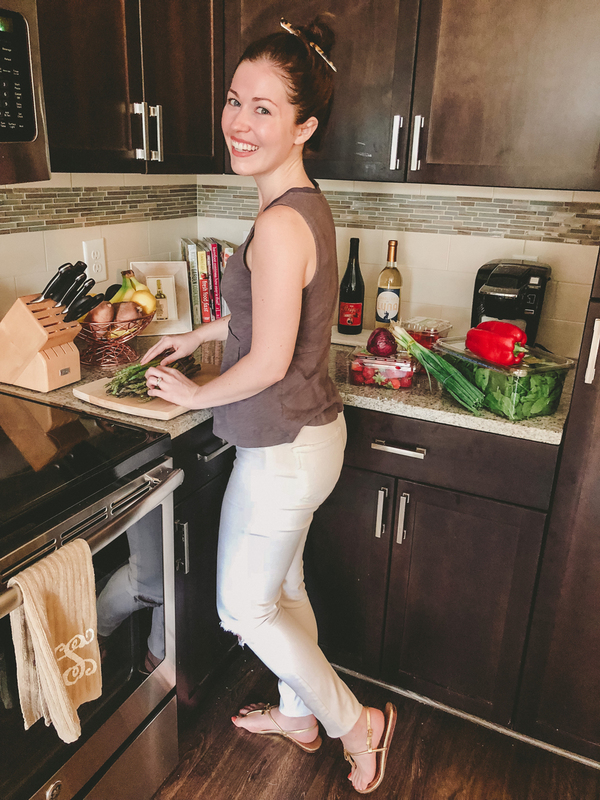 Around here you can expect soul-sister vibes, delicious whole foods without restrictive diets, and a cheerleader (okay, more like a pep-talker) supporting you through the journey. I love to remind you that you’re worthy. And when life happens, my hand is out there to help pick you up and remind you of why you started. I support the go-getters, the dreamers, the get-back-on-track’ers, the wine-sippers, the veggie-eaters and the burger-lovers. I received my training from the Institute for Integrative Nutrition, where I learned about more than 100 dietary theories and studied lifestyle coaching methods. every woman should feel whole, complete, and perfect. More importantly, I love food, dancing, hiking, hunkering down in a coffee shop, a good Skype sesh with my girlfriends, and spending time with my hubby and dog, Scout!! Q1. Will I get 1-ON-1 time with Lauren? Chances are, your question is one that many people want the answer to! The weekly calls and Facebook group are both great ways to get support. But, if you need 1x1 time, you’ll have the opportunity to book a 1x1 session for a discounted rate. Q2. Will my information be confidential and kept safe? Yes - We take every precaution to keep your information safe-guarded. Plus, this program gives you the opportunity to share only what is comfortable for you! Q3. Do I have to participate in group discussions? No, but this is where the magic happens! Q4. Do I have to complete each session before the next one is available? A new unit gets released every Thursday morning and is broken out into sections. You can complete them all at once, or bit by bit! It’s recommended, but not required, that you complete the unit before the next live call. Q5. Will the live coaching calls be recorded? The first part of the call will be recorded; however, the Q&A and live coaching will not be recorded to protect our community. I highly encourage you make note of the live calls on your calendar - you won’t want to miss them! Q6. What if I have a question or want advice on something that we’re not learning? Send me an email at connect@laurenstickney.com. If it’s something all of us could benefit from, I may ask that we share it with our broader community. Q7. I’m somewhat shy. Do I have to share? You don’t. The beautiful thing about this program is that you’ll learn from other people’s transformations. That being said, one of the most transformational parts of this program is when you do speak up; because the world (and this community!) needs your voice. Q8. What if I want to connect with other participants? That’s what this is all about! Connect away. Q9. Is there a refund policy? If you’re not 100% satisfied, and you can show me you’ve done the “work” (i.e. attended and participated on calls and in the Facebook group), e-mail connect@laurenstickney.com and you’ll only be responsible for the pro-rated share of the program that’s been delivered.